Looking for a monitored burglar alarm that will keep your home and your family safe and secure without costing the earth? The new WiComm Smart Security System from SafeHouse may be just what you’re looking for! WiComm is not your standard home alarm system… It is a smart, intuitive and reliable burglar alarm designed to be easy-to-use and managed remotely using a mobile app on your smartphone or tablet. 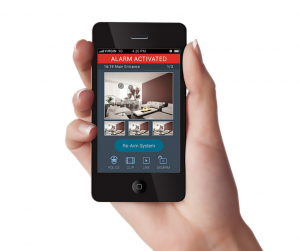 The state-of-the-art WiComm Mobile App allows you to arm and disarm your home alarm throughout the day, from wherever you are. It also displays photographs from inside your home whenever you wish to see them, meaning you can heck what is going on inside your property at any time. Should your monitored burglar alarm be triggered, you will receive an instant notification on your mobile device, allowing you to respond accordingly, without the hassle of having a ringing bell or siren on your home to annoy your neighbours! The Pan & Tilt WiComm camera sends image and video directly to youur mobile app. 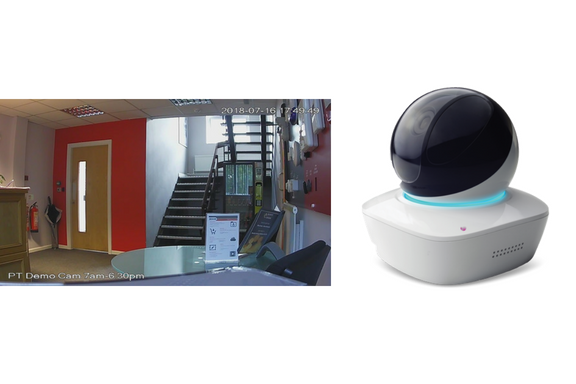 A range of clever monitored camera motion sensors, installed in your property, will take snap shots if your alarm is triggered and send them directly to your mobile app, meaning you are quickly able distinguish between a potential incident and a false alarm. The brand new WiComm pan and tilt camera allows you to stream high-definition video directly from inside your home too, plus you can hear what is going on, and respond through an audio panel, meaning you can challenge any intruder from a safe distance! Your device comes with hanging strips for easy installation. The WiComm Security System is designed to be self-installed and it couldn’t be simpler to get your monitored burglar alarm up and running. All programming and planning is performed at our head office before the system is mailed directly to you, complete with instructions and fixings. Your new, wireless smart home alarm system can be ready to use in minutes! FREE keyfob (worth £49) which attaches to your keyring and allows you to set and set your burglar alarm easily and quickly. FREE 6 months’ worth of monitoring service through our Alarm Receiving Centre plus a FREE back-up SIM card (normally £10 a month). Our Alarm Receiving Centre is manned 24-hours a day meaning that you have added peace of mind at if anything happens inside your home, someone will be able to respond instantly – this is superbly beneficial if you aren’t able to check our mobile phone or are in an out-of-signal area. *While stocks last. Issued on a first-come first-served basis. Click here and simply fill in the form, giving us a little more information about your home, and we will provide you with a FREE, no obligation quote for our WiComm Monitored Burglar Alarm.